I say this with a very serious face on. 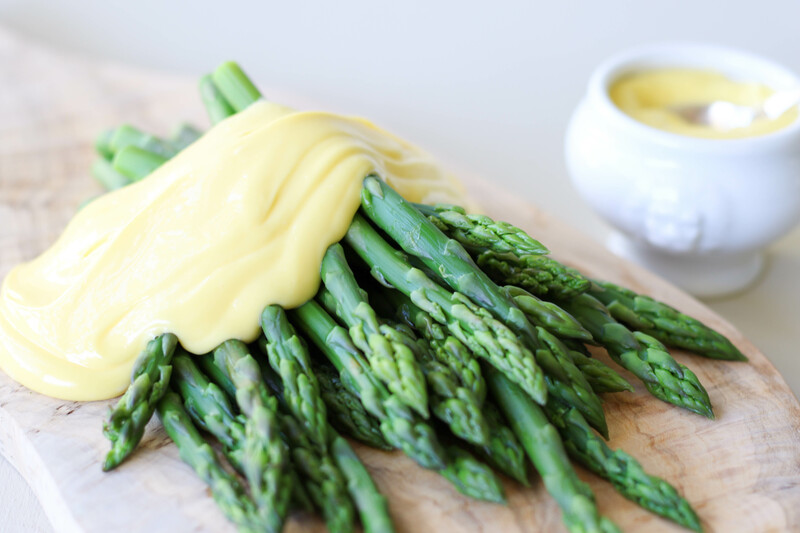 This is the best and easiest hollandaise sauce you will ever make. Now my old French chefs would be reading this in pure disgust when they discover i’ve ditched the whisk and plugged in the stick blender. Oh the horror. 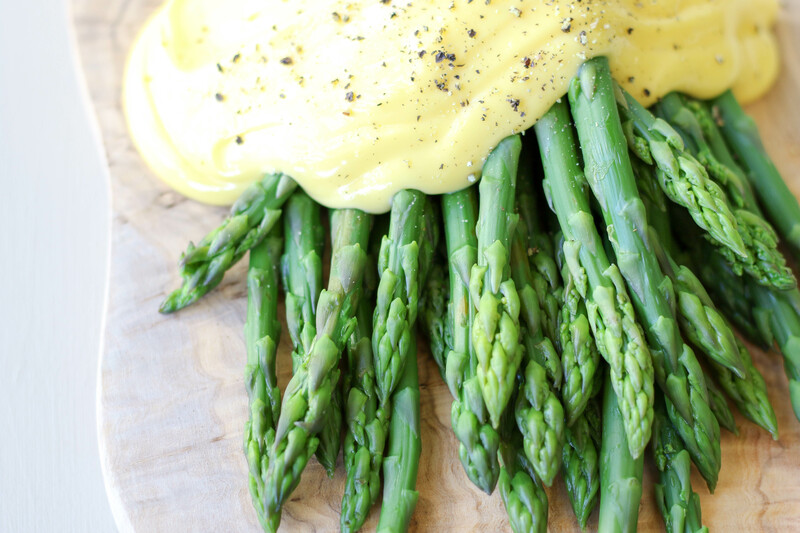 But I say life is too short for split hollandaise sauce and whisking egg yolks into submission. Not only does the immersion blender method work like a charm every single time, but it literally takes seconds. I mean- sometimes you just NEED buttery glorious golden deliciousness in seconds. Right? 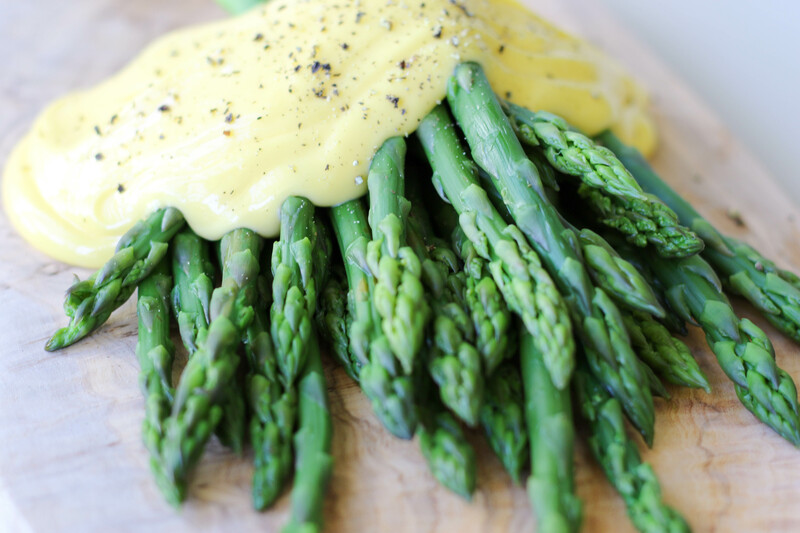 I felt slightly ill with the amount of hollandaise I ate after making this recipe. Please share it with a loved one. Because it’s addictive. It should come with a warning. BEWARE: You will eat all of me! 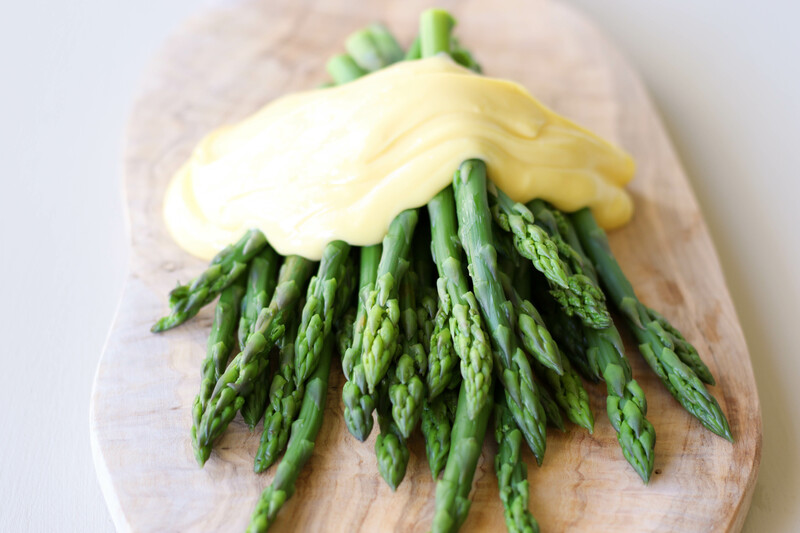 Hollandaise sauce with asparagus spears is just a winning combo. A perfect crunchy vehicle for your liquid gold. I steam mine for a few seconds in a dash of boiling water, they’re still pretty raw at this point, chuck the water out of pot and let them finish off in the residual heat with the lid on. 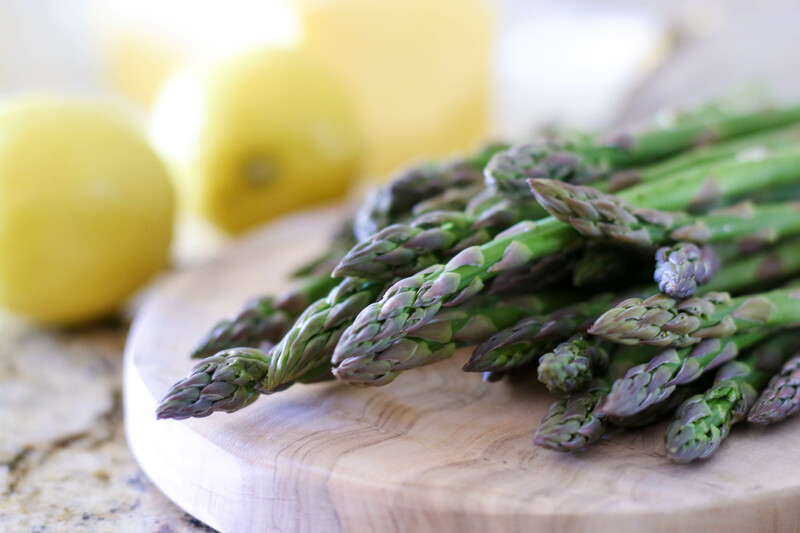 There is nothing worse that over cooked asparagus. If you think you’ve taken yours too far or aren’t going to eat them immediately the best thing to do is plunge them into ice water. This will remove all heat and stop the cooking process. Turn out onto clean paper towel and dry. Right! So let’s get started. Blenders at the ready! Melt butter in a sauce pan on medium-high heat. Give it a good swirl every now and again to keep the foam to a minimum. Place egg yolks, water, lemon juice and salt into a jug that fits your stick blender quite snugly. Blend the egg yolk mixture until thick and foamy. Transfer your hot melted butter to a little jug with a pouring spout. 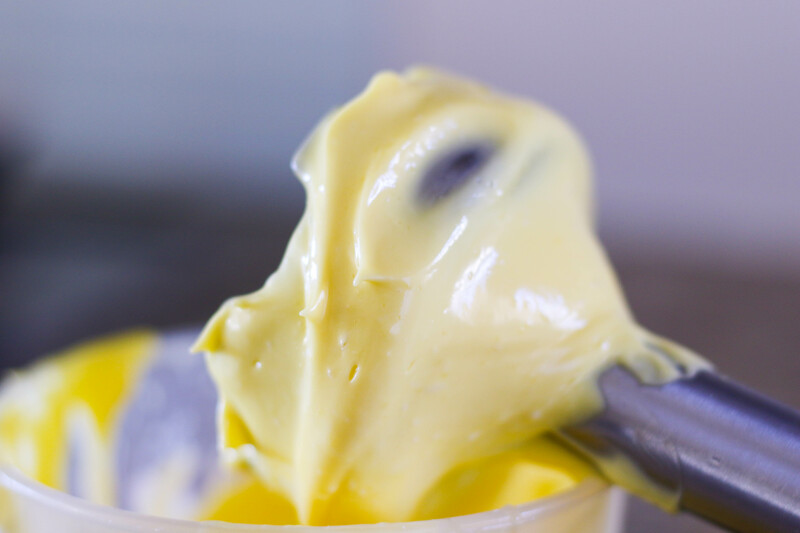 Gradually drizzle the butter into the egg yolk mixture while blending constantly. *Note: you will need both hands to pour the butter and blend at the same time. If you’re like me and alone in the kitchen your little jug will start spinning uncontrollably and you’ll need to do some acrobatics and uncomfortable wedging manoeuvres. So be smart and use a damp dish towel and wrap it around the jug you are blending in to keep it in place on the counter or get a buddy to hold onto it for you. Once you have drizzled in all the butter and your hollandaise is thick and shiny give it a taste and adjust seasoning. Add a pinch of black pepper or cayenne pepper to your taste. I love the cayenne- it gives it a great kick. 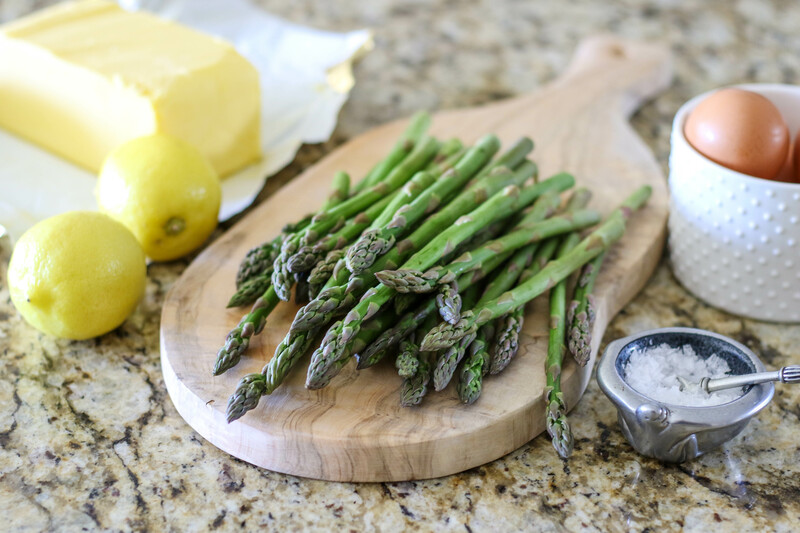 Serve it with steamed asparagus, artichokes, eggs Benedict or just eat it out of the jug with a spoon. Stick blender….Quelle Horreur!!! you got my vote though. I’m all for that stick blender.